(This post was written as a transcript of a short presentation I gave at a Melbourne TeachMeet at Melbourne High School 12 September 2015). How do you really get to know people in an online course? Ask a child! What would a child do? A child would play. And so we did in Rhizo15, the connected MOOC. It was new to me and I loved every minute. I felt encouraged and sent out an invitation to a Google Doc so we could write the play collaboratively. Hello there. My name is Tania Sheko. Thanks for responding so positively to this short piece of fiction/non-fiction. I’m taking up the suggestion to create something for #rhizoradio (suggested by Terry Elliott and seconded by Simon Ensor) and other suggestions to do a collaborative rewrite eg include a larger cast so we can actually (somehow) create a podcast for #rhizoradio (which is going to be a thing I think). Hope you can join me here! But how would we bring everyone together to produce the radio play/podcast? It’s near impossible to organize across timezones but if you sleep really late and I wake really early we might catch the ppl in the US 😉 or the opposite, if u wake really early and I sleep really late we can make it at a good time for everyone. Usually around 10pm my time that’s 2pm EDT and I think early-ish morning for you? In the end we decided to record our own parts on SoundCloud and send the file to Kevin Hodgson who generously took the time to put it all together. Autumm Caines created a really neat video promo. Autumm used the image created by Angela Brown in Pulp-O-Mizer. Kevin Hodgson used Thinglink for his promo. Sarah Honeychurch had fun remixing a popular Christmas tune for her promo. Here’s the final version of the play (although I wouldn’t be surprised if the Google doc version continues to evolve). 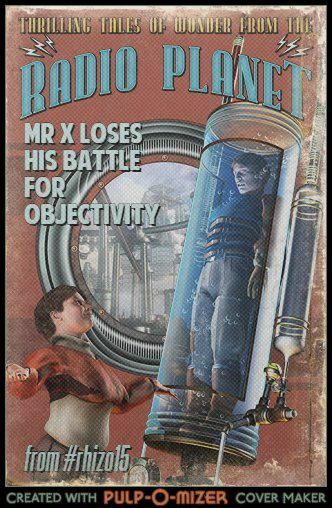 My original story, Mr X loses his battle for objectivity, has been stormed, hacked and now exists as an evolved creation belonging to those playing and learning in the rhizome (#rhizo15). It is no longer mine and that’s a fantastic thing, something I’m excited about. Thank you, everyone, for the experience – in particular to Kevin for putting together the audio files – but also to those contributing voices, to the voices in the chat comments for the evolving Google doc, to those on Twitter and other social media platforms, to the creative people designing promos, and anyone else I’ve forgotten. I know it sounds as if I’m accepting an Oscar (haha) but I really do want to thank all of you for the fun we’ve had together. Was this a success in educational terms? We had fun! Maha: it was some of the BEST fun I ever had… wish I could find a way to encourage my students to do something like this of their own initiative, but that’s not thinking rhizomatically… so I should think of how to create an environment that encourages the spirit of this kind of thing and see what emerges from their work!!! We unpacked rhizomatic learning collaboratively and creatively. We got to know each other through play. We were amazed by each other – as each person initiated ideas and created things because they were inspired to do so. We keep in touch – in subsequent MOOCs, through hashtag conversations on Twitter. We reach out to each other with questions and challenges. We jump in when we see requests for collaboration and opportunities to do things together. I learned about different tech tools but more importantly why and how to use them. I added their blogs to my Inoreader, so I could keep reading them, I followed them on Twitter and made sure I added a Tweetdeck column to see what they were saying/doing, I explored what else they did online eg Soundcloud, Slideshare, Google +, in Facebook groups, and wherever else they were. Don’t tell me that you can’t form friendships online. After the presentations when we had the opportunity to chat at the pub (which is where all the great conversation takes place) someone said to me that they were expecting me to talk about risk when showing them how I shared my play, not knowing how people would respond. I could definitely have talked about risk and so many other things but the 7 minutes didn’t allow it. Risk is part of play and creativity – you never know if what you share will be taken up, ignored or worse! What’s important in this situation is trust – trust that you know the people in your community well enough to be able to go out on a limb. That’s the difference between network and community in my opinion. Rhizo15 was (and still is) a community in which you got to know people well enough that you were able to take risks and be supported. In my case, my experimentation with the play as a way of playfully addressing the ‘learning subjectives’ was not only appreciated by people but they came in and played with me further. We remixed the play together and did so many other things that were creative and allowed people to bring their understanding and expertise to what is actually a serious academic context. Through play we achieved something we could not have done if we were just writing out our thoughts in a traditional way. I think there’s a lot more I could explore here about play, and that will have to wait. There’s something powerful about documenting the experience itself — this reflective stance is how we take the concept of “play” and move it into a direction of learning. This collaboration was powerful on any number of levels, not the least of which was the coordination of people and writers and media from all over the world to create a work of art (of sorts). I agree, and then when you read the post and leave a comment, the collaborative thinking extends even further. I love that. Do you have a new blog, Kevin?